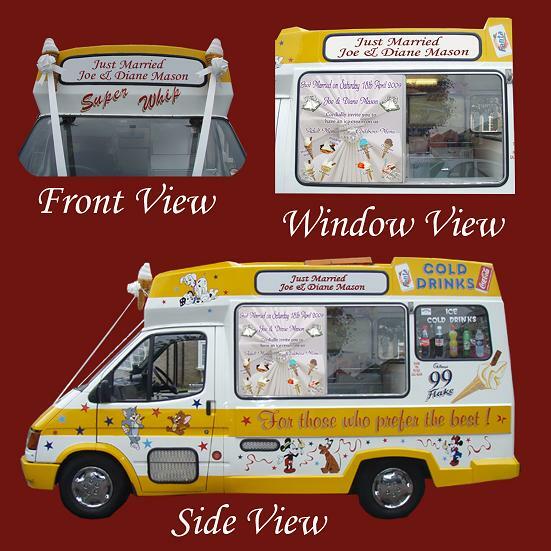 Would you like to hire just a run of the mill ice cream van or would you prefer to stand out from the crowd with something different? Do you Want to keep the children happy on these occassions? This can be difficult when your on the go from morning till night. 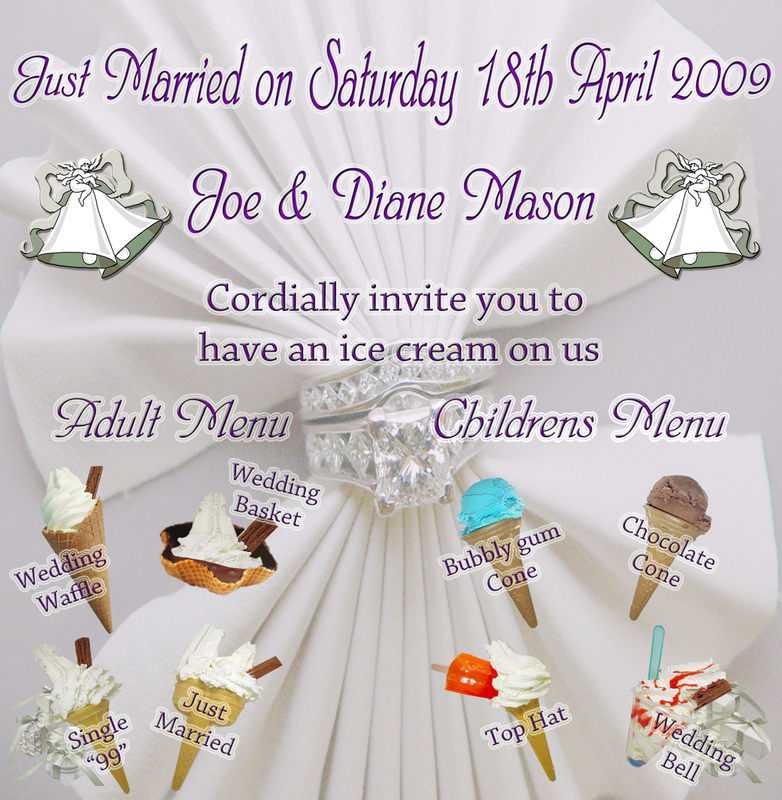 We at fairs and fetes offer an ice cream van hire service with a difference, where we would arrive at a pre-arranged time for your wedding/reception with a bespoke serving window sticker on the van (see pic for sample or email us for more info) with your names dates and our special wedding menu on the sticker (choice of 3 sticker designs). (chimes playing wedding march if requested & wedding bows if requested), once we arrive if requested you may take photos of the happy couple by the van with your own personal window sticker in view to add that little extra memory to your day. We will then serve ice cream to your guests and there children. As far as we know there is no other company currently offering this taylor made service in the uk. We are committed to providing a quality service, from food preparation standards to litter collection at the end of the event - we can work with you to provide the level of service you need. Indoor events can now be catered for (subject to access) with our optional electric drive system. 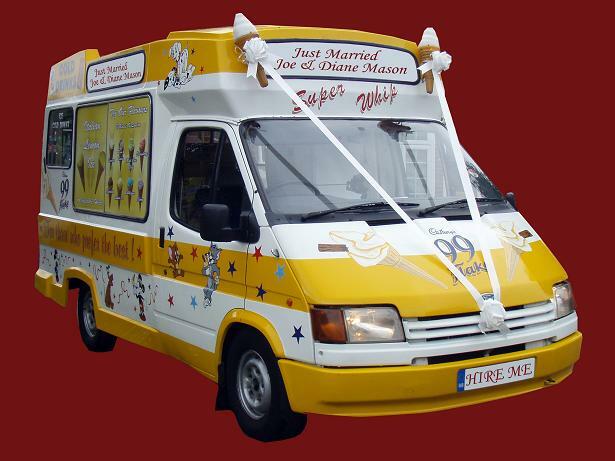 This means you can have a real fully working ice cream van at your indoor event, exhibition, concert, TV or film set. All that is required is a standard 32 Amp 240 Volt electricity supply. This system can also be implemented out doors, where a van operating in a static position may cause environmental concern's such as noise and air pollution issues/worries. These later two problems are completely removed when the electric drive system is used. Prices on request and are based on cost per head, location, travel time, and hire time etc. Better quality photos can be emailed to you on request to give you an idea how the van will look on the day. Please use the contact us button or event booking form to provide us with as many details as you can of what you will require for your special day,including any special requests you may have.